Pineapple sage has been in Australia a long time and was called S. rutilans originally but along the way has been changed to elegans. I generally leave it as rutilans but the golden leaf version came in to the country as elegans so I call it that. Pineapple sage is mostly sold as salvia rutilans still throughout the country as it is such a nuisance to change printed labels and you will find it under rutilans here. Pineapple sage suckers readily and creates a large multi stemmed shrub. It can get to 2m high with regular water, shorter without. This salvia smells of pineapple but I don’t think it tastes like it. The foliage is coarse and not inviting to chew but the long red flowers are a bit more interesting to eat or float in drinks. This golden variation of salvia elegans, pineapple sage, makes a good colour contrast. It still has the pineapple fragrance. ‘Golden Delicious’ needs hot sun to colour the foliage well. Red flowers in summer and autumn add to the colour. It has not been in Australia many years to be sure but it seems shorter in growth to the other elegans although you can probably plan for 1.5m high. Unless you want a tall plant it would be good to slash a mature plant to near ground level in mid summer or half of it. 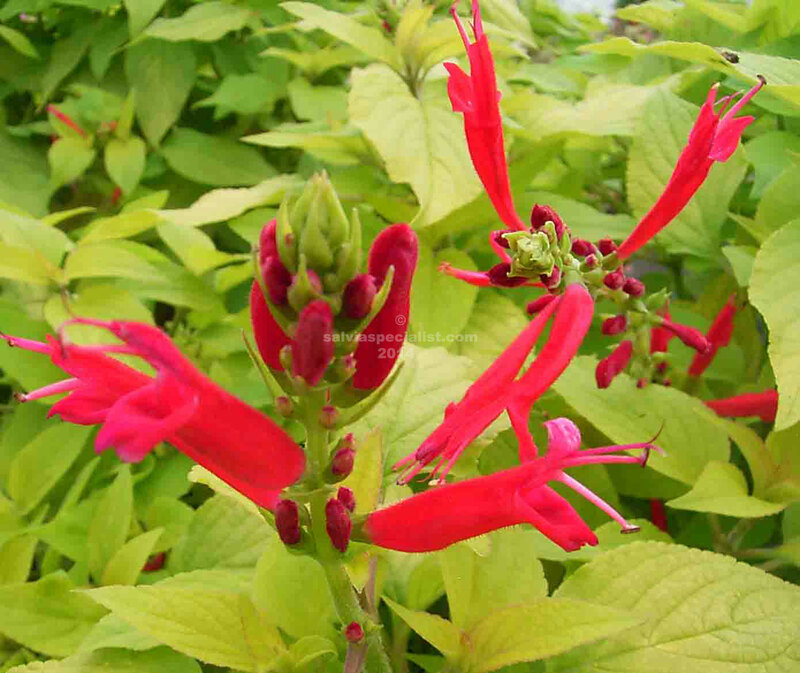 Pineapple sage often sets seed so there can be variations in the red colour. Pineapple sage will frost burn but an established plant should re-emerge from the roots.